NEW YORK, New York, January 6, 2013 (ENS) – The UN General Assembly has decided to ‘strengthen and upgrade’ the United Nations Environment Programme, UNEP, and establish universal membership of its governing body. UNEP is the “voice of the environment” in the UN system, the UN said in a statement announcing the status upgrade for UNEP. The agency’s mandate is to coordinate the development of environmental policy consensus by keeping the global environment under review, and bringing emerging issues to the attention of governments and the international community for action. The General Assembly resolution provides for UNEP to receive secure, stable and increased financial resources from the regular budget of the UN, and calls for other UNEP donors to increase their voluntary funding. The decision allows full participation of all 193 UN member states at the UNEP Governing Council in February 2013. Before the General Assembly’s action, UNEP’s Governing Council consisted of just 58 members. Earlier efforts to ensure wider representation in the running of UNEP resulted in the creation of the Global Ministerial Environment Forum, which brought together the world’s environment ministers for high-level meetings in parallel with the Governing Council. Member states will implement the provisions of the resolution, including arrangements for the future of the Global Ministerial Environment Forum, at the first meeting of the newly-enlarged Governing Council at UNEP headquarters in Nairobi on February 18-22. The provisions contained in the resolution are among the first practical steps by the UN General Assembly to implement the commitment by world leaders at the UN Conference on Sustainable Development (Rio+20) last June to improve the institutional framework for sustainable development. “Universal membership of UNEP’s Governing Council establishes a new, fully-representative platform to strengthen the environmental dimension of sustainable development, and provides all governments with an equal voice on the decisions and action needed to support the global environment, and ensure a fairer share of the world’s resources for all,” Steiner said. UNEP administers many multilateral environmental agreements and conventions, including the Ozone Secretariat and the Montreal Protocol’s Multilateral Fund, the Convention on Biological Diversity, the Convention on International Trade in Endangered Species, and a growing family of chemicals-related agreements. In the 40 years since UNEP was established following the 1972 Stockholm Conference on the Human Environment, the environmental challenges facing humanity – from diminishing water resources and desertification, to climate change and hazardous chemicals – have increased in number and complexity. Yet international responses to these challenges are often fragmented and weak. The latest edition of UNEP’s “Global Environment Outlook” report, released in June 2012, assessed 90 of the most important environmental goals agreed by the international community, and found that significant progress had only been made in four. The report warns that if current trends continue, critical thresholds beyond which irreversible changes to the life-support functions of the planet could be exceeded. The General Assembly’s decision reflects the commitment of member states to improve global cooperation on the environment in order to meet such challenges, and to promote the integration of the social, economic, and environmental pillars of sustainable development, as well as improving coordination within the UN system. “The resolution reaffirms UNEP’s role as the UN’s authority on the environment, and provides the mandate to enhance our ongoing work on bringing the latest science to policy-makers, directly supporting national and regional environmental efforts, improving access to technology, and other key areas. 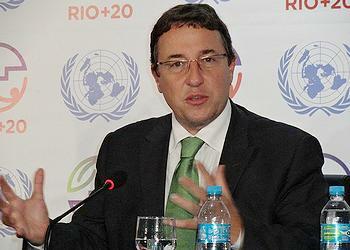 For UNEP and the environmental community, this is a truly historic day,” said Steiner. 1979: Bonn Convention on Migratory Species (CMS) established. The agreement involves 116 member states and has overseen binding agreements and action plans to protect 120 migratory species. 1987: Montreal Protocol on Substances that Deplete the Ozone Layer established. One of the most successful multilateral agreements in UN history, the protocol has overseen a 98 percent reduction of controlled ozone depleting substances, and delivered multiple health benefits, including millions of avoided cases of cancer and eye cataracts. 1988 Intergovernmental Panel on Climate Change (IPCC) established by UNEP and the World Meteorological Organization. The panel delivers the world’s most influential, comprehensive and scientifically-reviewed reports on climate change. 1995: Basel Ban Amendment barring export of hazardous wastes adopted. Ratified by 70 countries and the EU, the agreement established a regime for minimization of health and environmental impacts of waste. 2002: Launch of Partnership for Clean Fuels and Vehicles. Among other activities, the project has assisted countries in Sub-Saharan Africa to successfully phase out or begin the phase-out of leaded fuel. Associated health savings for the continent are estimated at US$92 billion per year. 2012: Launch of Climate and Clean Air Coalition to Reduce Short-Lived Climate Pollutants: Voluntary initiative to reduce emissions of black carbon, methane, low-level ozone, hydrofluorocarbons (HFCs), and other short-lived climate pollutants (SCLPs), to tackle climate change and improve human health. In less than 12 months, some 25 governments and additional partners have joined the coalition.